← First Anniversary Party – Saturday, Sept. 22, 2012 – 4 to 8 p.m.
Over a hundred guests joined us in the Gallery for our September 22 First Anniversary Party. We shared wine, cheese, cider, and home-baked desserts, and were entertained outdoors by Walt Burnham on piano. Kathy Litchfield, our newest fiber artist, demonstrated weaving on her loom. The party was a huge success! We showed off our beautiful space, and our guests bought jewelry, gifts, and artwork. Did you miss the party? Come see us at our next event, on November 3, 2012 when we will be celebrating new members at a party from 12-6 pm at the gallery. 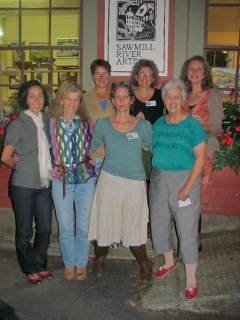 Painters Judith Seelig and Kate Spencer, jeweler John Moore and fiber artist Kathy Litchfield will be featured.